Throughout Pennsylvania, a minor celebration is underway. In a rare and unexpected move on Wednesday, the Department of Environmental Protection issued a temporary halt on construction of the Mariner East 2 natural gas project, citing violations of two different permits. “Everyone really needs to take a deep breath, feel good about this, and acknowledge that this is a big deal,” Lynda Farrell, executive director of the Pipeline Safety Coalition, told Earther. The coalition has been challenging this particular set of natural gas pipelines since 2013. Back then, Sunoco Pipeline L.P., the company behind the project, reached out to the Pennsylvania-based nonprofit and shared its plan for two pipelines would run 350 miles, from Ohio to the Marcus Hook Refinery along the Delaware River, on the Pennsylvania-Delaware border. The coalition couldn’t support the project then, Farrell said, and it certainly doesn’t support it now. Why? The group looks at safety exclusively—and it didn’t find the project safe at all. Every natural gas pipeline runs the risk of leaks and, ultimately, gas explosions. She’s talking about places like Shamona Creek Elementary School in Downingtown, and the dozens of homes that line the pipeline corridor in Chester County, Pennsylvania. Now, the state environmental agency is finally stepping in—after a year of mud spills and water contamination problems since construction began. “The corrective actions outlined in the [Consent Order and Agreement] are steps [the department] is taking to hold Sunoco accountable and protect local residents,” said Secretary Patrick McDonnell, in a statement. The controversy over this pipeline project, however, is far from over. Mariner East 2 includes two natural gas pipelines that are set to run parallel to each other. Both are slated to run 350 miles from the Marcellus Shale region through 17 counties, carrying nearly 300,000 barrels of shale gas a day. 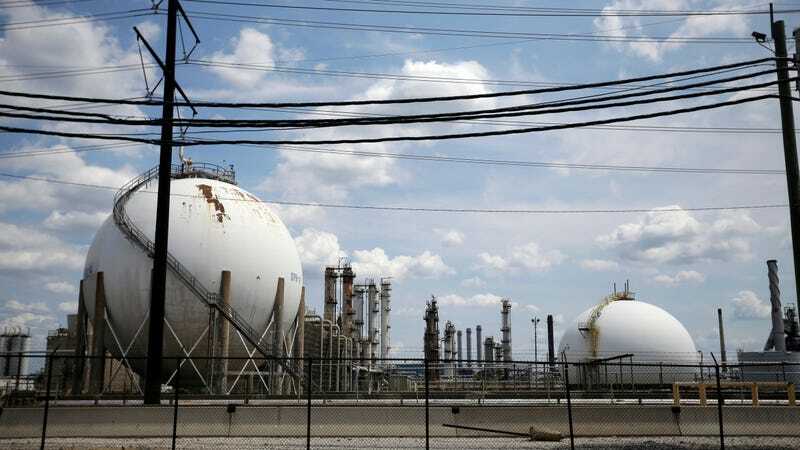 The pipeline’s final destination, in Delaware County’s Marcus Hook, has a 19 percent poverty rate and one of the highest concentrations of black residents in the state. This is where the refinery that would process the gas, and ultimately pollute nearby communities, is located. These two pipelines are part of a larger project from Sunoco, Mariner East. The Mariner East 1 Pipeline runs 300 miles through the state. It finished construction and began shipping ethane in 2014. Last month, it finally began transporting both ethane and propane (two forms of natural gas) into the Marcus Hook Industrial Complex in Delaware County. It can now move up to 70,000 barrels a day. The Mariner East 2 project would increase that capacity to 345,000 barrels a day. Part of Mariner East 2 was supposed to be completed by the end of last year, but a number of problems have delayed that. The project’s been a headache since its construction began last year. Then there are the incidents. The state lists more than 30 environmental violations since May, and that’s just the ones Pennsylvania has acted on. Farrell said not all violations people report receive a response from the state agency, and that the project’s seen more than 100 spills since construction began. According to NPR, at least 42 drilling mud spills across at least 10 counties occurred from April 25 through June 17 of last year. These happen when drilling solution used to lubricate the horizontal drilling spills out during construction. Spills like this release bentonite, which isn’t toxic, but the mud-like substance can clog up aquifers and reduce water quality in streams and wetlands. It’s definitely not good. On top of that, the project has ruined private water supplies for 14 households. The Department of Environmental Protection is now requiring Sunoco to identify all homeowners with private water supplies within 150 feet of impacted areas. Sunoco must also notify all these households of drilling 24 hours before it begins. It’s also got 10 days to come up with a Water Supply Restoration Plan to lay out an alternate source of drinking water in case this happens again. “To impact a person’s private drinking water is inexcusable, and we intend to hold this operator accountable to the fullest extent,” Secretary McDonnell went on in the department’s statement. Speaking of operators, Sunoco is a subsidiary of Energy Transfer Partners, the company behind the Dakota Access Pipeline. Y’know, that 1,172-mile long crude oil pipeline that ignited a wave of indigenous-led resistance in North Dakota back in 2016. The best word Minott can find to describe the company so far is “cavalier,” meaning they just don’t seem to care. Groups plan to do what they can to stop the pipeline, or at least make sure it’s in accordance with the law. For the Clean Air Council, the courtroom is the place to go. It’s already filed two lawsuits regarding this pipeline. For the Pipeline Safety Coalition, the community comes first. They’ll be working with constituents and their elected officials to make everyone knows about this project. Will the state surprise opponents again, and shut down the Mariner East 2 project for good? Probably not, but it’s possible the project will continue to give them reason to. As Minott put it, the agency may be “embarrassed into” taking action—again.